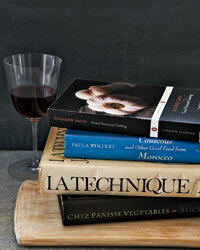 A surprising number of sensational chefs learned their kitchen moves by reading cookbooks. Here, some of their most memorable lessons. When he was working as a caterer, Patrick O’Connell would often study the cookbooks at his local library during his downtime. He discovered his affinity for French food while reading the works of legendary writer Elizabeth David; he especially loved the sorrel sauce he found in her 1960 book, French Provincial Cooking. When he opened The Inn at Little Washington in Washington, Virginia, he experimented with sorrel in lots of different ways, eventually creating this exquisite, tangy mousse. Tom Colicchio, the chef-owner of Craft restaurants and ’wichcraft and head judge on Bravo’s Top Chef, learned to cook using Jacques Pépin’s 1976 La Technique and 1979 La Methode. The books’ lessons came in handy during an apprenticeship at the Hôtel de France in Gascony, in southwest France. One morning, Colicchio showed up for work after a long night of drinking. “The chef took one look at me, said ‘I have a job for you’ and pointed at a box with a big, dead hare in it. Luckily, Jacques had written about prepping rabbit, so I knew what to do.” Colicchio (an F&W Best New Chef 1991) perfected the dish when he was working at Manhattan’s Gramercy Tavern, braising the tender rabbit with sweet tomatoes, spicy soppressata and olives. Naomi Pomeroy, an F&W Best New Chef 2009, regards eco-activist Alice Waters as “the center of the vegetable-driven universe.” At Beast in Portland, Oregon, Pomeroy serves her version of the salsa verde in Waters’s 1996 book Chez Panisse Vegetables, adding toasted hazelnuts and doubling the herbs. The salsa is a vibrant addition to simple grilled hanger steak. When Mourad Lahlou first came to the U.S. from Morocco to study economics, he taught himself to cook because he was too broke to eat out. He had never heard of famed Mediterranean-food writer Paula Wolfert until she walked into his first Bay Area restaurant, Kasbah, over 10 years ago. “She knew more about my food than I did,” says Lahlou. He then began using her 1973 cookbook, Couscous and Other Good Food From Morocco, to help him make recipes like this spiced shrimp stew; the dish is on his menu at Aziza in San Francisco. Michael Black, an army brat, grew up eating his Okinawan mother’s cooking in Japan, North Carolina and Germany. When he became a professional chef, he sometimes re-created those dishes with the help of a comprehensive book from the 1970s about Okinawan food, Ryukyu Ryori. Black’s mother made this incredibly simple salad with only three ingredients: long, thin Japanese cucumbers, shoyu (Japanese soy sauce) and bonito flakes (shavings of dried smoked bonito, a kind of tuna). Black’s version, which he serves at San Francisco’s cult Japanese restaurant Sebo, is topped with a lovely sesame-soy vinaigrette and scallions.